Dimensions (HxWxD): 1.25" x 2" x 1.5"
This totally unique 1.25 inch high Apophyllite Multi Point Cluster from Pune, India, weighing 1.97 oz. or 56 grams, is both an amazing mineralogical collector's item and a powerful natural healing tool. 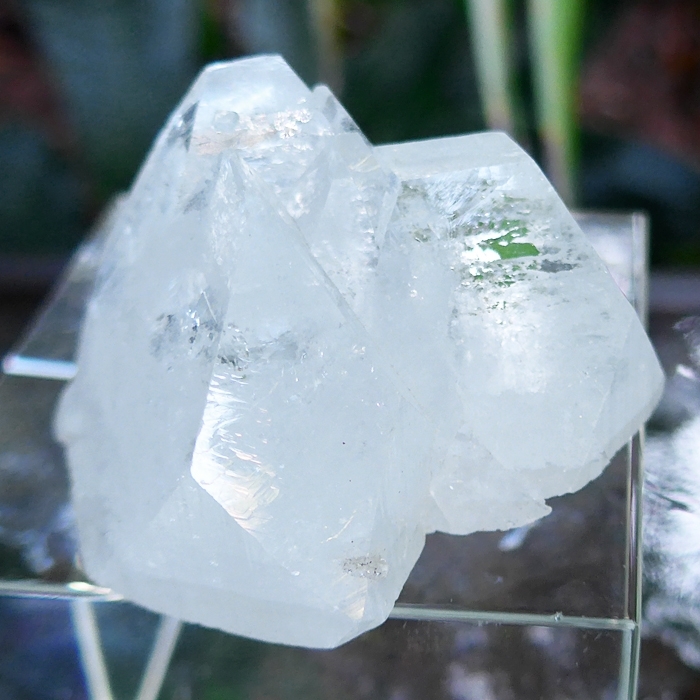 This lovely Apophyllite specimen, from Pune, India, is a collector's items with substantial mineralogical and metaphysical value, suitable for an advanced energy healer or experienced practitioner of meditation. The name apophyllite refers to a specific group of phylosilicate minerals, a class of minerals that also includes the micas. Over the last decade some amazing, huge seams of collector’s quality apophyllite have been found in the area near Pune, India. Apophyllite is composed of hydrated potassium calcium silicate, and forms tabular crystals of cubic or octahedral structure, occasionally exhibiting a bipyramidal formation. Apophyllite occurs naturally in green, white and translucent/clear colors. The highest quality apophyllite, will exhibit a translucent pearly sheen on the shaft of the crystal formation and transparent, vitreous prism faces. Apophyllite is an aid to meditation and helps make a conscious connection with the spiritual world. This stone stimulates the third-eye, but primarily acts on the crown chakra facilitating "tuning in" in accordance with ones consciousness and intention. 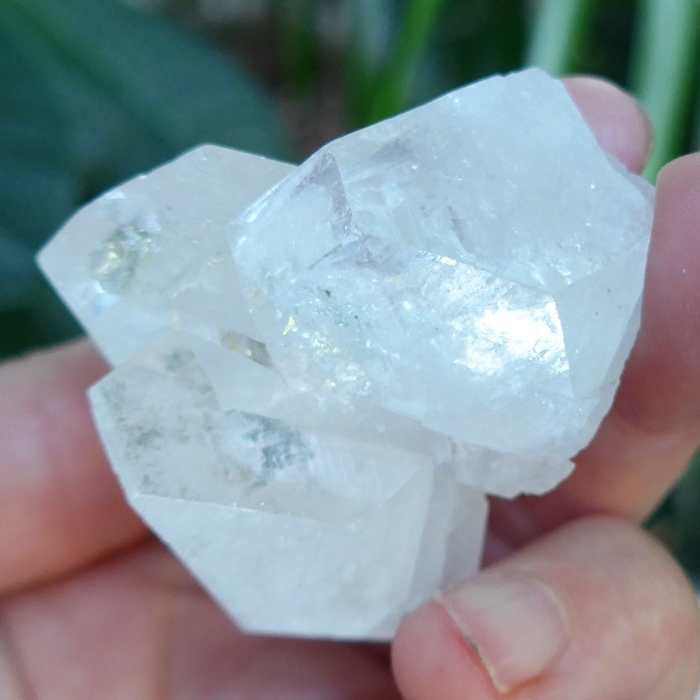 Apophyllite is a wonderful gazing stone that facilitates clairvoyance or spiritual "seeing". Apophyllite can also be used to activate and open the heart chakra, energize the sluggish or closed heart and stimulate feelings of joy and celebration of life. Since the research of Dr. Patrick Flanagan with Pyramid Power in the 1980s, many crystal healers and New Age practitioners have extolled the value of the pyramid to concentrate Universal Life Force Energy for healing, for preserving and energizing food and water, and for promoting longevity. The natural pyramids formed by Apophyllite are thus considered by crystal healers to be energizing and useful in healing sessions. Beautiful Apophyllite pyramids can be used as altarpieces. With the stone on your altar, simply attune your mind to the Apophyllite and make it your intention to align your own energies with the energies of the stone. 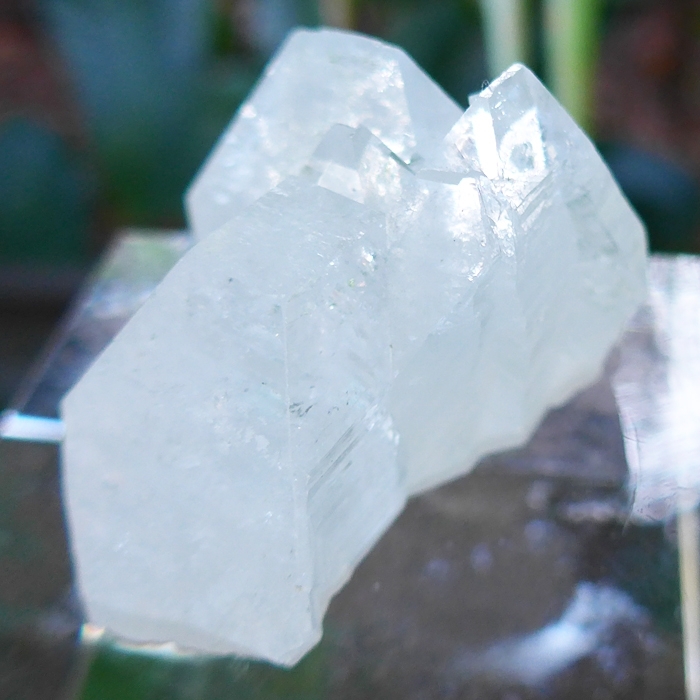 The Apophyllite transmits energy, so it will work to attune its environment ever more closely to the higher vibrational frequencies of the spiritual world, benefiting anyone in the immediate area, especially anyone doing meditation or energy healing. 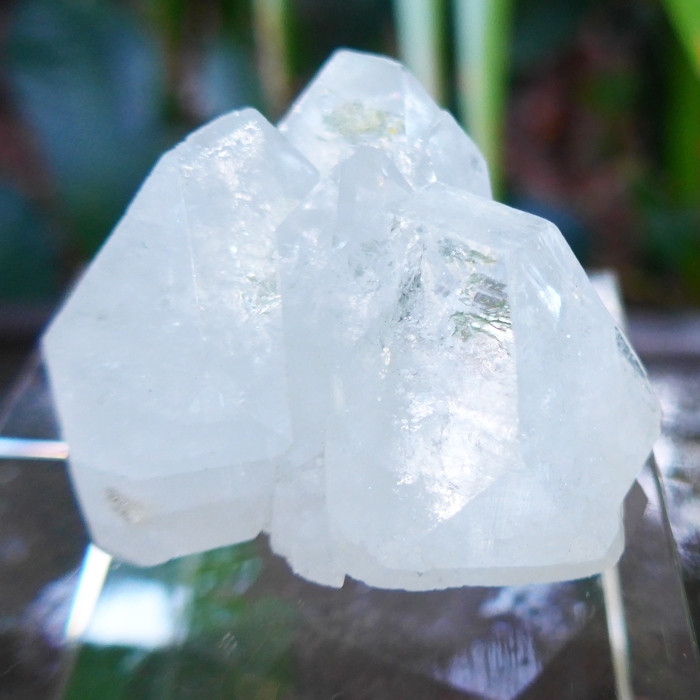 You can also use these powerful apophyllite crystals as a meditation tool. Hold the stone in your hand during meditation, and experience its powerful effects. As you go deeper into meditation, simply place the stone next to you on your cushion. Jane and I have found that it is very powerful in meditation. When Jane first put a piece in her left palm and meditated briefly, she went INSIDE the crystal. She didn’t realize that at first, just saw a big pyramidal chamber (the apophyllite was shaped like a little pyramid) from Atlantean times, with lots of beautiful details to it, and accessed very interesting information while in the healing chamber. Apophyllite is one of the very few minerals considered powerful enough to clear negative energies out of quartz crystals, so you can also use this precious stone as a power source to clean and clear other crystals in your collection. Note: Weight above is shipping weight. Net weight is 56 grams or 1.97 oz.